I am going through a spicy and sweet stage. I always thought of spicy as something to have at dinner – laksa, anyone? – but as my love of baking increases, so does my curiosity with combining different tastes. 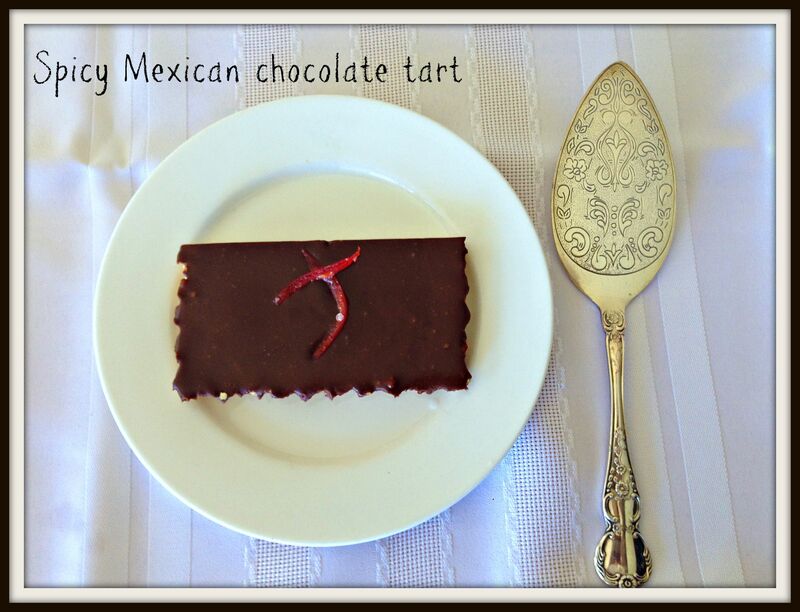 My light bulb moment with this spicy Mexican chocolate tart came one night when I was looking in the pantry for a nightcap of spiced rum and a nibble of chocolate. 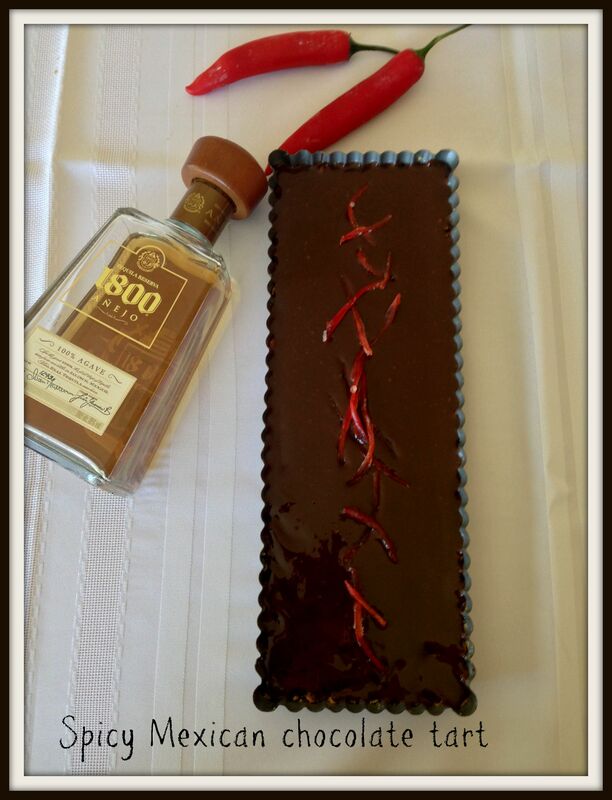 I saw a bottle of my favourite tequila sitting alongside some dark chocolate and cinnamon and lo and behold – a glamorous dessert was born. 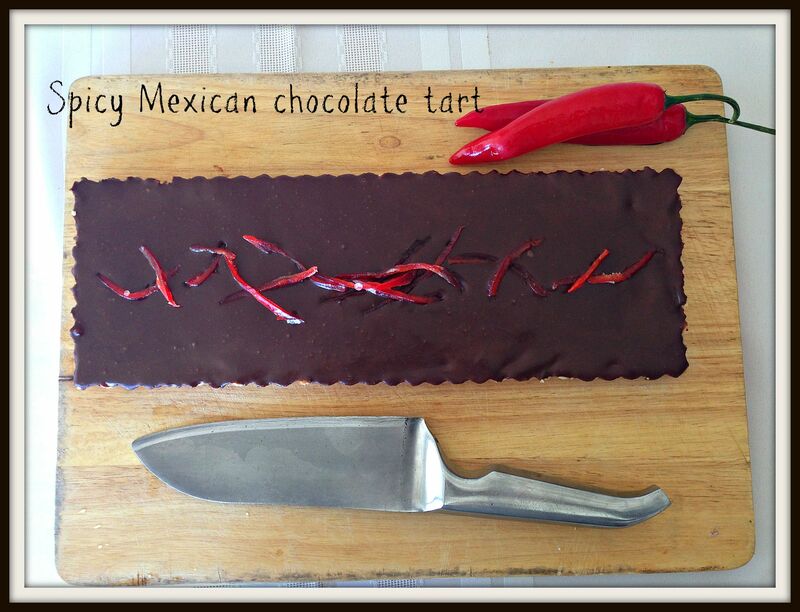 The flavours of Mexico – spice from the cinnamon, heat from the chilli, tequila – shine through. 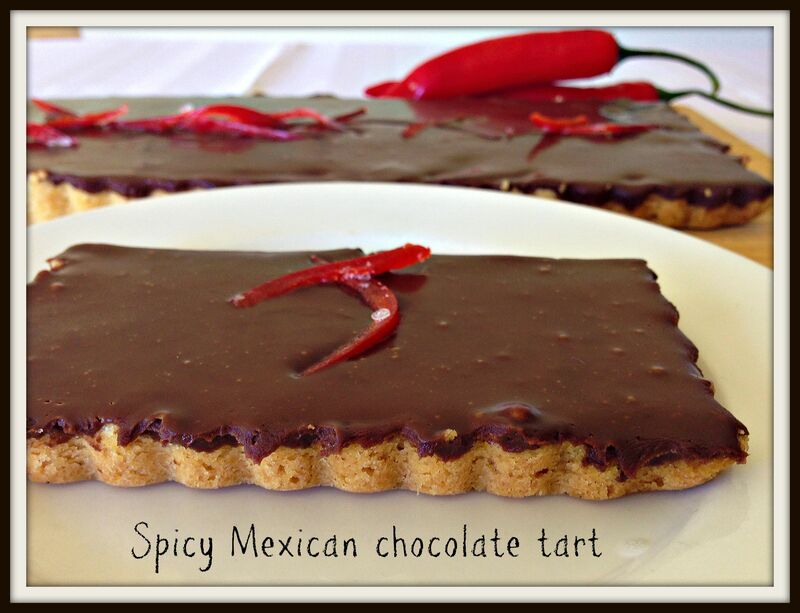 It goes without saying that this is an adults-only dessert – even if your young ‘un has a taste for chilli the fact that the tequila isn’t cooked off means it isn’t suitable. This recipe is made of up several different steps, all of which can be done a day before you want to serve the tart. All the steps are simple and fuss-free, yet the finished product looks (and tastes) luscious. If you do nothing else I would recommend making the candied red chilli the night before. This gives the sugar syrup and chilli a decent getting-to-know-you time, resulting in a better, less harsh flavour. Ensure you deseed the chilli to remove most of the heat, and use big chillis, not the teeny heat-packing birds eye variety. I used the excess sugar syrup left-over from making the candied red chilli to dress a chocolate cake – I will share that recipe soon. 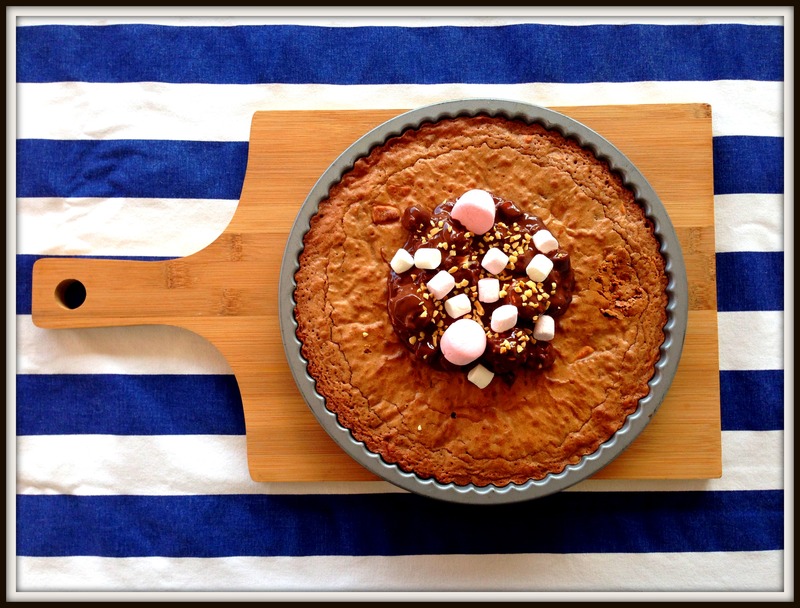 This tart can serve 8 generously, or 12 if you cut into smaller squares. 1- 2 tablespoons tequila – the amount required will depend on the quality of your liquor. Make a sugar syrup by combing the water and sugar in a small pan over a low heat. Stir frequently until the sugar has dissolved, then simmer for 20 minutes (stirring and scrapping the bottom) until syrup is thick and reduced. Remove from heat then add sliced red chilli to pan. When pan and syrup are cool cover with plastic wrap and place in fridge overnight. In a large bowl stir together all the crust ingredients with a spoon until a soft dough forms – this should take about one minute. Spray a 35cm x 4cm rectangular tart pan with removable base with non-stick cooking spray and press the dough all over the base and up the sides of the pan. Using the bottom of a glass helps with this. Cover with plastic wrap and place in fridge for half an hour. Remove plastic wrap from tart and use a fork to prick the pastry base all over. Bake for 20-24 minutes, until lightly golden. In a small saucepan place the chocolate with the cream and stir over a low heat until melted, thick and glossy – keep a close eye on it as you don’t want it to burn or boil. Allow to stand 15 minutes, then stir in the tequila, tasting as you go. Remove chilli from syrup (you don’t need the syrup) and place chilli on sheet of baking paper. 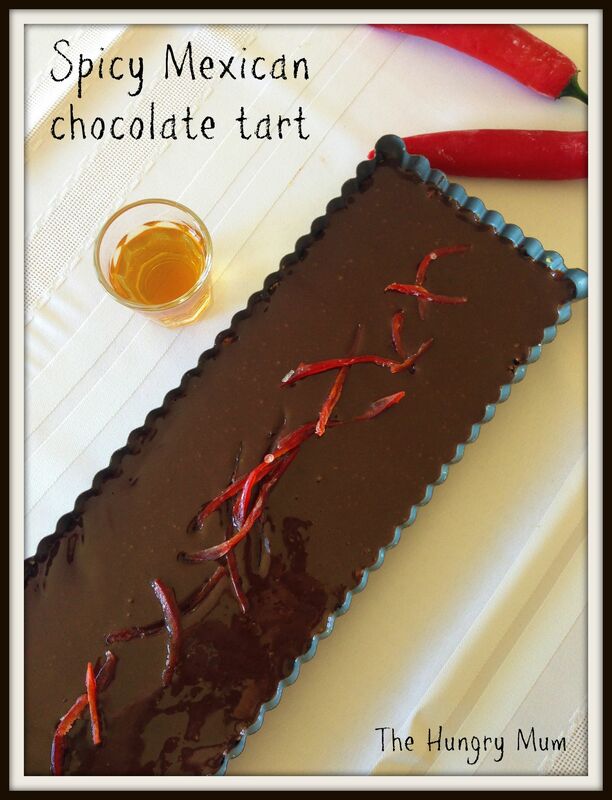 When pastry base has cooled to room temperature pour in the ganache (give it a quick stir first) then decorate the top with the candied chilli. Slice in thin wedges to serve.